Metals are industrially recovered from solution by cementation where metals from solution are exchanged with zinc. Here we use cementation as a form of art. The painting illustrates the cementation of gold, silver, iron, tin, nickel, copper and cobalt out of Ionic Liquids. All the metals are grey due to their nano-structure. 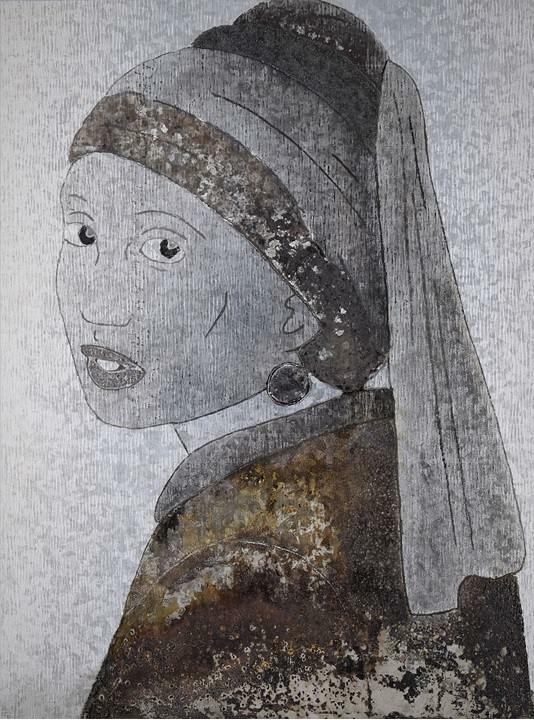 Fifty spots of coloured metal solutions were painted onto a piece of galvanised steel to demonstrate how this spontaneous redox chemistry results in the Girl with the Metallic Earring.